All are welcome to attend one of the many educational dinner seminars located throughout Suffolk County. Every three years, clients receive a free “elder law estate planning checkup” to review existing plans in light of any necessary possible changes in family structure and/or financial situations. Many New Yorkers use the expression “out on the Island” when referring to Suffolk County, one of the most diverse regions in the state with its range in income, education, and demographics. With a census population of 7.7MM in 2013, Long Island is the most populated island in any U.S. state or territory and it is also the longest and largest island in the contiguous United States. Melville, located in the Town of Huntington, is no exception. Located immediately off of Exit 49 of the Long Island Expressway (one of the country's busiest highways), it is the home to many international and national corporations like Canon U.S.A., Hain Celestial, and global human resources giant Adecco. Bohemia's unusual name is due to the fact that a proportionately large amount of immigrants from Czechoslovakia made their home here in the mid 1880's in this hamlet bordered by Central Islip and Great River to the west; Islandia, Ronkonkoma and Lake Ronkonkoma to the north; Holbrook to the east; and Oakdale, Sayville, West Sayville, and Bayport to the south. Southampton, out in the southeastern most part of Long Island has one of the oldest Main Streets in the country. Over the past two decades, the town has been increasing popular among celebrities and entertainers who invite distinguished and even infamous guests to enjoy the singular setting of its pristine landscape. Suffolk is also the leading architectural county in the state of New York and first in farming. Its abundance of re-developed potato fields have become one of the country's most notable wine regions. Combining age-old growing techniques with state-of-the-art technology, Suffolk County produces wines known throughout the world. The Town of Huntington also is home to one of the most vibrant annual tulip festivals, thanks to its rich soil. New Yorkers gather from all over the state to witness Spring there. International travelers receive peace and tranquity on Suffolk County's vast and pristine coastline along East Hampton, Amagansett, Southhampton, Montauk, Shelter Island, and Sag Harbor – to mention only a few. 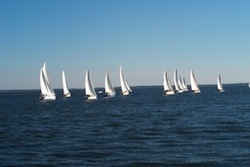 Some of the country's finest marinas are also located in Suffolk County and boating and sailing occupy much of the residents' free time in its scenic waters. Golf courses, too, in Dix Hills, Melville, Shinnecock Country Club in Southhampton, provide dramatic and challenging play due to Long Island's remarkable geography. 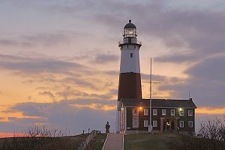 The Montauk Lighthouse's history is also extraordinary – President Washington commissioned it in order to set up a warning system for the new country from possible maritime attacks from unfriendly foreign nations. Suffolk County is part of the 10th Judicial District of the New York State Unified Court System, and its Surrogate's Court hears cases involving the affairs of decedents, probate of wills and the administration of estates, guardianships, and adoptions. A brief description of this Long Island County would not be complete without mention of the Poospatuck and Shinnecock Indians who have been a part of the population for thousands of years. Part of the Algonquin-speaking people, the tribe's land base is within the geographic boundaries of the Town of Southampton and is considered to hold one of the most powerful pow-pows today. Disclaimer: Most of these photographs have been found under “Wikipedia Commons”. Please contact the webmaster of this site if you would like credit for your photograph.